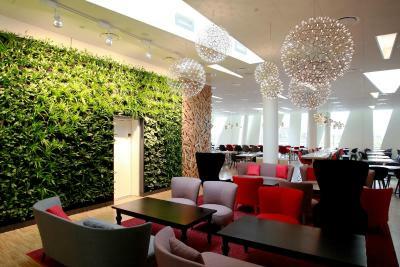 Lock in a great price for AC Hotel by Marriott Bella Sky Copenhagen – rated 8.4 by recent guests! The breakfast was amazing! Very good quality of everything. The city view was more like a park view, but we saw some cows in the park so that was cool. Nice to be so high up that no one can see you in the window! We were on the 21 floor. Room was cozy with a tub. The staff are superb. Our room was very comfortable. Breakfast was really good. Service and staff were great too. Awesome views and good connectivity. The room was well furnished too. As always, the service was fantastic. Staff is extremely prof and friendly. This place is astounding in every way. The shuttle service is fantastic, the design is magnificent (especially in room with views) and the staff! They all went above and beyond to help us- especially night manager on Dec 23/24 and kind young women at check in and check out. 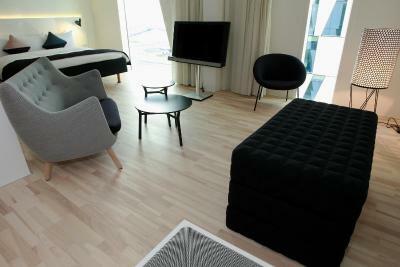 We have been to Copenhagen 3 times and this was the best hotel in all areas of all. We took bus directly to Tivoli to see Christmas Wonderland. The way back we got a bit lost but all part of the adventure! SO now that we understand the bus system, I would definitely choose this hotel over the other more centrally located one we stayed at in Vesterbro or the truly uncomfortable one we stayed at right by airport. 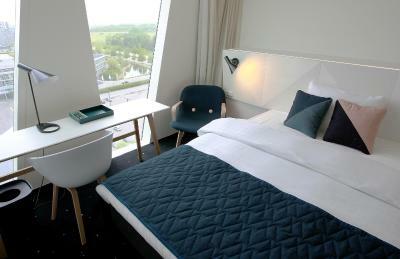 DO yourself a favor and enjoy your stay by booking this first class accommodation! 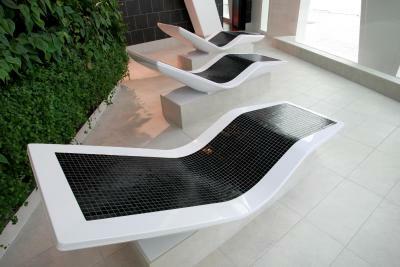 I AM not on commission- I simply adored our stay here! I was able to take the metro into the city rather than taking the very expensive taxis. It was Perfect! 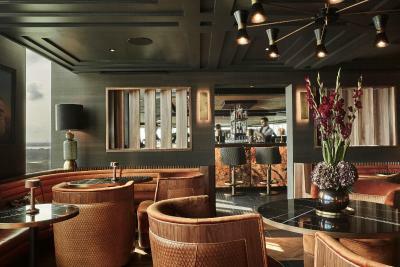 The bar at +23 was really astonishing! 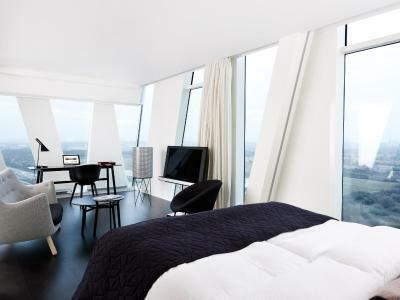 AC Hotel by Marriott Bella Sky Copenhagen This rating is a reflection of how the property compares to the industry standard when it comes to price, facilities and services available. It's based on a self-evaluation by the property. Use this rating to help choose your stay! 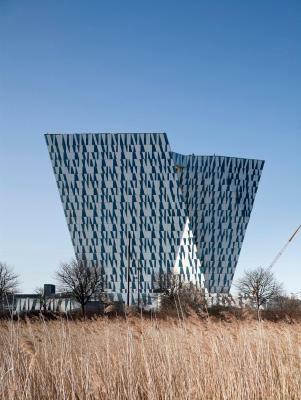 One of our top picks in Copenhagen.Located next to Copenhagen’s Bella Center, this hotel features distinctive and modern architecture. 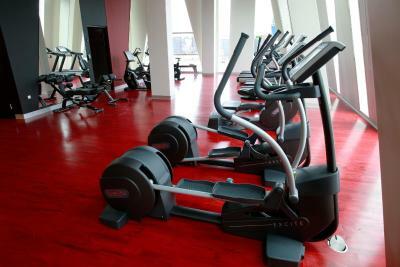 Its soundproofed rooms have flat-screen TVs, tea/coffee makers and floor-to-ceiling windows. 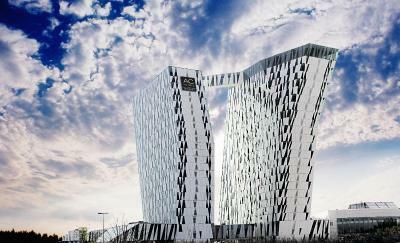 AC Hotel Bella Sky Copenhagen features 2 leaning towers connected by a top-floor bridge. 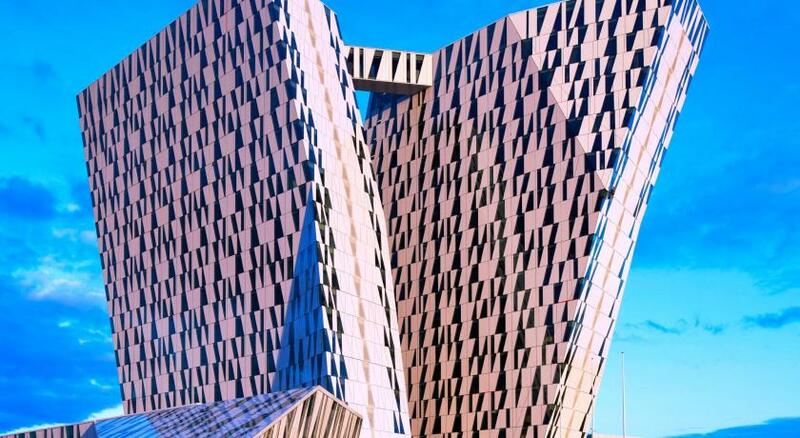 Relaxation facilities at AC Hotel Bella Sky’s 2789 ft² wellness center include hot tubs, massaging showers, saunas and steam baths. Free WiFi internet is available throughout the hotel. 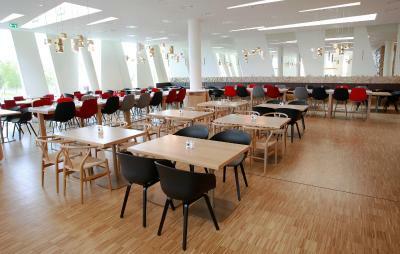 The 3 on-site restaurants offer various dining options. 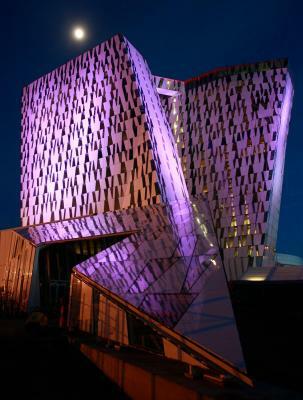 Bella Center Metro Station is 350 feet from the hotel, with the city and Copenhagen Airport just 15 minutes away. 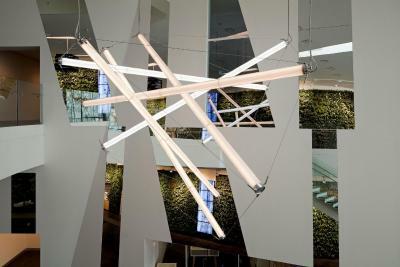 Field's shopping center is 0.9 mi away from AC Hotel Bella Sky Copenhagen. 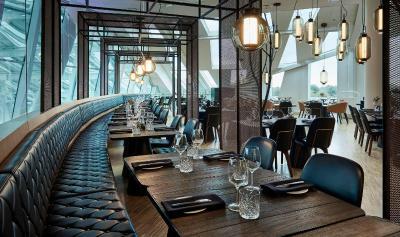 Amager Vest is a great choice for travelers interested in old-town exploration, city trips and atmosphere. When would you like to stay at AC Hotel by Marriott Bella Sky Copenhagen? 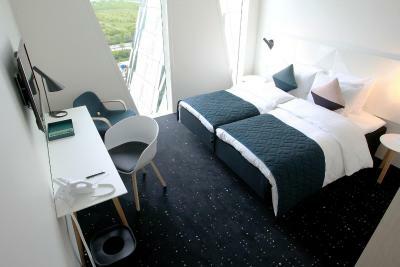 This air-conditioned, modern room offers more space, as well as a minibar, tea/coffee facilities and flat-screen TV. 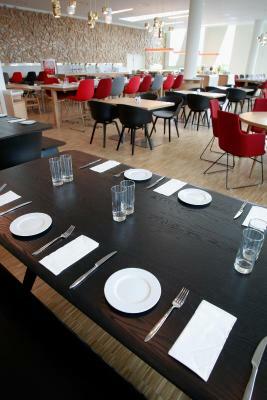 Public parking is available on site (reservation is not needed) and costs DKK 100 per day. 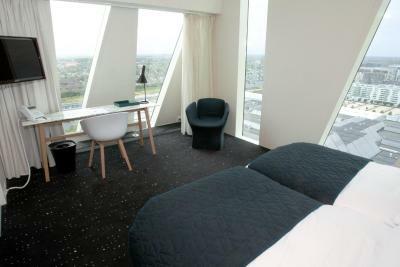 This corner suite features floor-to-ceiling windows with a city view, as well as a sitting area with a sofa. 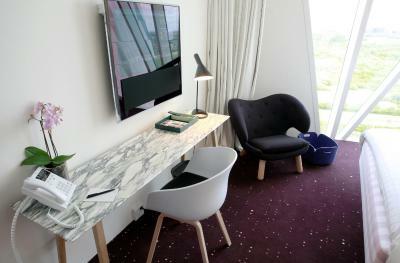 Also includes air conditioning, as well as a minibar, tea/coffee facilities and flat-screen TV. 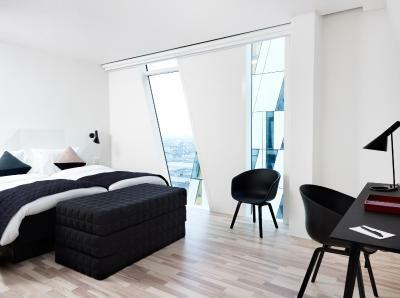 Offering a corner view with floor-to-ceiling windows, this spacious, modern room features a sofa and air conditioning. 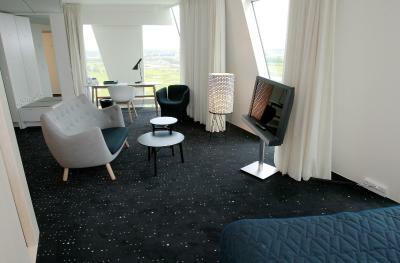 It also has a minibar, tea/coffee facilities and flat-screen TV. Spacious, modern room that features a sitting area and air conditioning, as well as a minibar, tea/coffee facilities and flat-screen TV. 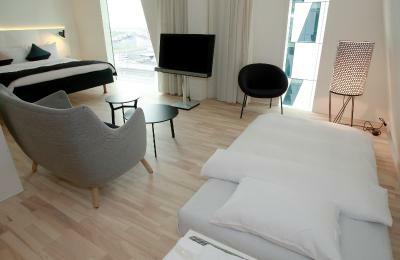 Modern, air-conditioned room that includes a minibar, tea/coffee facilities and flat-screen TV. 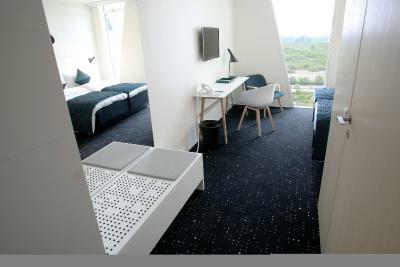 This twin/double room features air conditioning, tea/coffee maker and mini-bar. 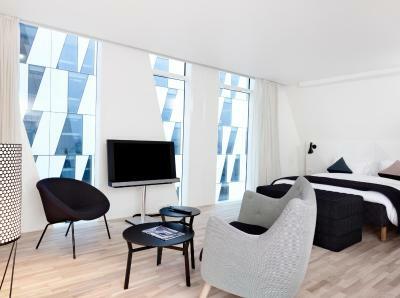 House Rules AC Hotel by Marriott Bella Sky Copenhagen takes special requests – add in the next step! 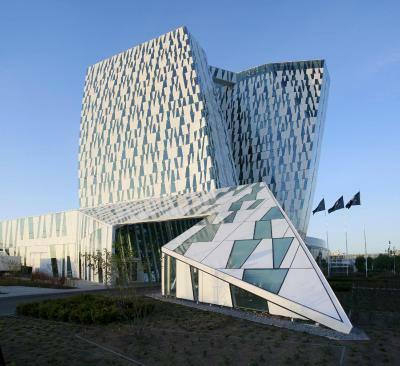 AC Hotel by Marriott Bella Sky Copenhagen accepts these cards and reserves the right to temporarily hold an amount prior to arrival. Please note that additional charges apply when paying with foreign credit cards. Please contact the hotel in advance to inform them of the age of any accompanying children. The shuttle bus from Copenhagen Airport runs every 30 minutes from 06:00 until 23:00. Directions for the airport shuttle bus can be found by the Airport Information Desk at Terminal 3. Minibar - wasn't clear what belongs to the minibar and what not. 1) Room was too cold, and no way to raise the temperature. The best we could do for the kids was to ask for more blankets! 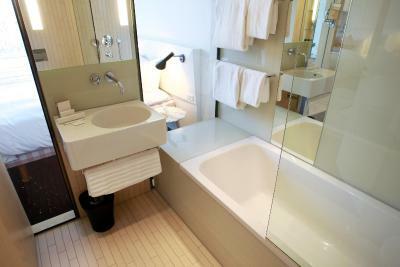 2) Moreover, the bathroom had a transparent wall, which could be fun for some couples, but not for families. When asked to replace the room, one staff agreed to help. However, the failed to arrange a new room. 3) The deluxe room, albeit specious, but had poor ventilation, and smelled all the time (specially the WC). 4) The reception was too busy most of the time, with long queues . I understand it was the Easter season, but such a huge hotel should have more than 2 receptionists serving their guests ! 5) Value for money was low. 6) parking was not free, although the hotel was out of the city. 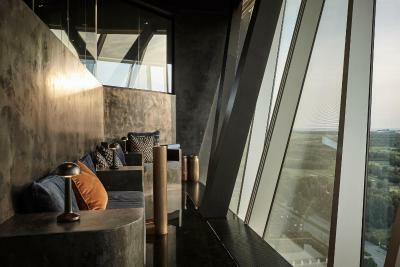 We did not like that we could not seat at the window in sky bar Even though it was free place. 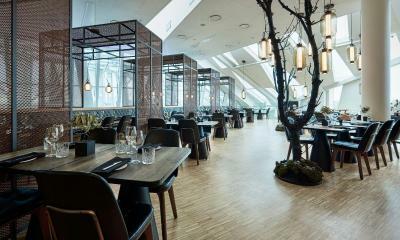 Easy access to CPH and city centre. A deposit we weren't warned about before! I don't mind against it in general, but I'd like to be informed beforehand. That kinda ruined the impression. Also there was no free bottled water in the room. Quite strange and I really missed it. And we had only one shower gel bottle for two. By the way, these decorative dots that should hide the person in shower don't really hide anything if you get closer. I also didn't get the mention about 12 euros for the wi-fi while having free one at the same time. A good room in general. Nice hairdryer. A wide set of bathroom accesorries. Nice view. 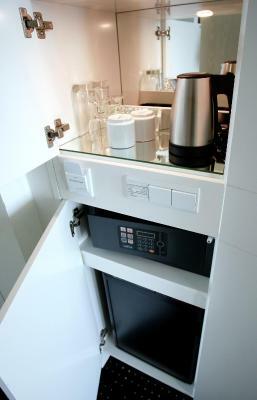 Automated minibar. Onsite eateries expensive and not vegetarian friendly. However discovered shopping centre 1.5k away on last day with plenty of cafes on last day ! The curtains had stains on them and the renovation was a bit old. Toothbrush provided in the room was too hard. We didn't use them at all. The staff there were very helpful and friendly. Our flight landed at 7am, we couldn't check in until 15pm, so the reception gave us free pass to the spa centre to wash up and relax a bit. They always gave us very useful and helpful information when we asked. 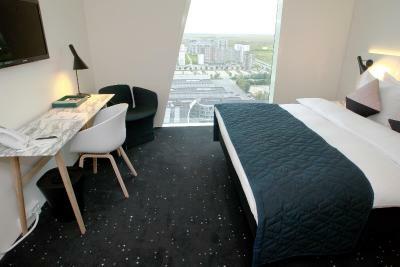 The hotel was near a metro station and takes only 10 minute ride to the city centre. And one stop away (which is about 10 minute walk), you can find a big shopping centre with restaurants, shops and a big supermarket. The bathroom smelled of sewer. Also I wanted to prepay for the spa access and was told i couldnt . The stay was a surprise stsycation for my husband and some of the surprise would be revealed w the transaction so I passed on doing it. Reception should offer it as an option when u check in. The check-in was stressful because there was a queue and because of that you had to be very fast. I couldn’t even ask questions and so the staff was nice but you could feel the stress. This is the only negative thing I have to mention.